Longbow Resort is a remote cabin getaway spanning two square miles in Prim, Arkansas, between Greers Ferry Lake and Mountain View in the Ozarks. Named Arkansas’ own “Garden of Eden” and described as a “secluded, enchanted paradise” by Southern Living magazine, this breathtaking resort preserves the natural beauty of its landscape while providing guests a perfect setting in which to relax and embrace nature. 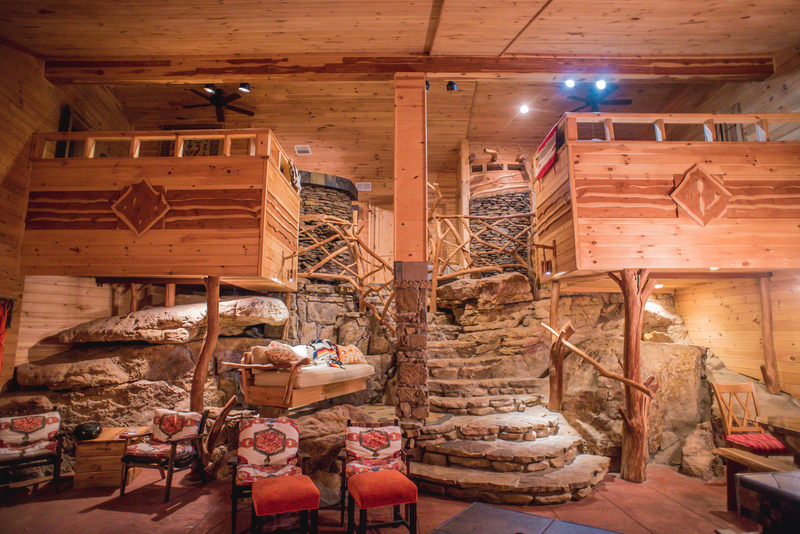 Cradled in the beautiful Ozark landscape, Longbow Resort’s four rustic and secluded cabins are striking in design. Longbow, Bushmaster, Bois d’Arc, and Sovereign (names reflecting our archery heritage) embrace waterfalls, mountain streams, towering cliffs, and vista views. Designed by nature, their interiors feature rock and wood elements, which heighten the natural theme. Longbow Resort offers solitude along with the amenities necessary for the comfort and leisure of each guest. Longbow Resort is an ideal getaway for honeymooners seeking relaxation and romance, couples wanting to explore the outdoors, and small families planning an adventure. A hike along one of the many trails means an opportunity to photograph an eagle soaring above and witness the myriad of other wildlife residing here. At Home in Arkansas magazine described Longbow as the “perfect location to spot wildlife, swim in a clear stream, or hike through the forest,” and the opportunity is yours—when you’re not lazily swinging from a hammock. Longbow Resort is more than just a unique place for getting away from it all. It is the story of one family’s legacy. Archery legend Ben Pearson bought this rugged Ozark paradise in 1966. His son, Ben Pearson Jr., created Longbow Resort in 1992, preserving the legacy and vision of his father in a one-of-a-kind Ozark retreat. The spirit of archery is engrained at Longbow and its footprint is deep, which only heightens the mystique and aura surrounding this special place. Copyright © 2019 Longbow Resort. Powered by WordPress. Theme: Accelerate by ThemeGrill.